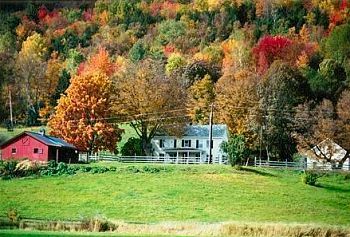 A romantic Vermont farmhouse in the heart of the Mad River Valley, just minutes from Sugarbush Resort and Golf Club. Savor spectacular views of the Green Mountains, gardens and pastures from our relaxing porch swings. Stroll to Historic Waitsfield Village, visit our covered bridges, and enjoy fine restaurants, shopping and nightlife. At day’s end, luxuriate in our Seven spacious guestrooms, all with elegant private baths and Jacuzzis, some with woodstoves. In the morning, indulge in our sumptuous gourmet breakfasts as you ease into Vermont’s tranquil pace. Originally a dairy farm, the Inn was stylishly renovated in 2003, while retaining all of the charm of the original 1850s farmhouse. The dairy barn and silo highlight the property, and guests love feeding resident horses, Bear & Blue. Warm fires, breathtaking views and intimate guest rooms make the Yellow Farmhouse Inn the perfect choice for your special Vermont getaway. This and other Sugarbush Bed and Breakfast Inns can be found here online in The Register.